Up with the sun this morning in the hopes of making Pittsburgh by sunset. Before leaving, walked down to the campground host trailer to pay, but it was padlocked, with frozen ice on the deck. They’re probably in Florida. 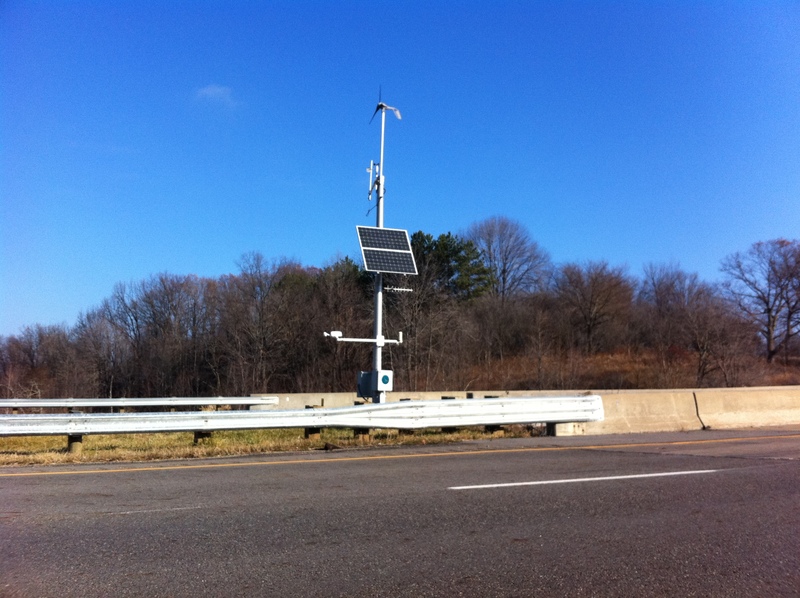 So rolled on down the highway, where I saw this great combined solar/wind system being used by the state Dept. of Transportation. Rolled on to Steubenville to meet a reporter with the Herald Star (thanks, Connie & Tasha at Kwik King for the hot chocolate on the house). He seemed stunned by the number of people who walked up to ask about the trike as we conducted the interview. Then pedaled across the bridge spanning the Ohio River into West Virginia. Got several miles down the road before I heard police sirens behind me. The two squad cars didn’t pass me, they pulled over right behind me. The first officer informed me that bikes were not permitted on Hwy. 22. This was news to me and I explained that I had avoided Interstate 70 for that very reason. The second officer smilingly told me they had received a call that a “kid on a go-cart was riding down the highway.” Not too far off the mark. When they heard my story, and that I was trying to make Pittsburgh by dark, they graciously gave me the go-ahead to continue riding on the shoulder. Thanks, officers! 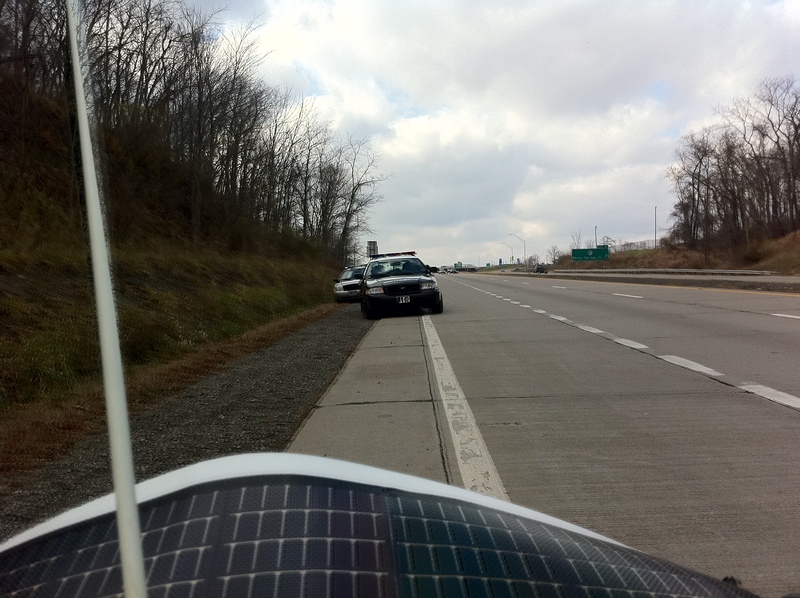 About 22 miles outside of Pittsburgh, was pulled over by another patrol car. This officer also told me bikes were not allowed on Hwy. 22 and that I would have to exit and take the windy, mountain roads into the city. Being told I had to pedal through “extremely difficult” terrain was not what I wanted to hear this late in the day, especially being so close to my destination. Even with the electric motor providing a little help up hills, my legs were still about shot and my battery nearly dead. I made my case, but he just asked for my license. Just when it looked like I might not make Pittsburgh by tonight after all, he came back from his patrol car, handed me my license said I had clearance to pedal on the shoulder into the city. A huge relief, and much appreciated. A few miles later, the incessant rumble strips finally took their toll, causing my iPhone to shake loose. Still attached by a cord to the solar charger, it took a bad bounce and fell through one of the “Fred Flintstone” holes in the bottom of the trike, dragging along the pavement until I could pull over. I fished it up through the hole and discovered the glass had been badly chipped on two corners, including the one with the camera lens, but it still worked. So now you know: the iPhone4 can take a licking and keep on ticking. Got the usual honks and looks today, but even more as I got closer to the city. Maybe the Steelers colors of the trike have something to do with it. Was delighted to find a Primanti Bros. on the edge of town, where I devoured one of their famous sandwiches and knocked back couple of Iron City Lights. Pedaling back up the steep hill to the motel, a hawk alighted on a tree directly above me and watched my slow progress. Thanks to Mike for helping me get the trike into the motel room. Big ride day today: 65 miles, and my legs are feeling every mile of it. This entry was posted in 2010 Ride, Articles, Blog, Video and tagged fred flintstone, herald star, ohio, pittsburgh, police, ride for renewables, west virginia. Bookmark the permalink.